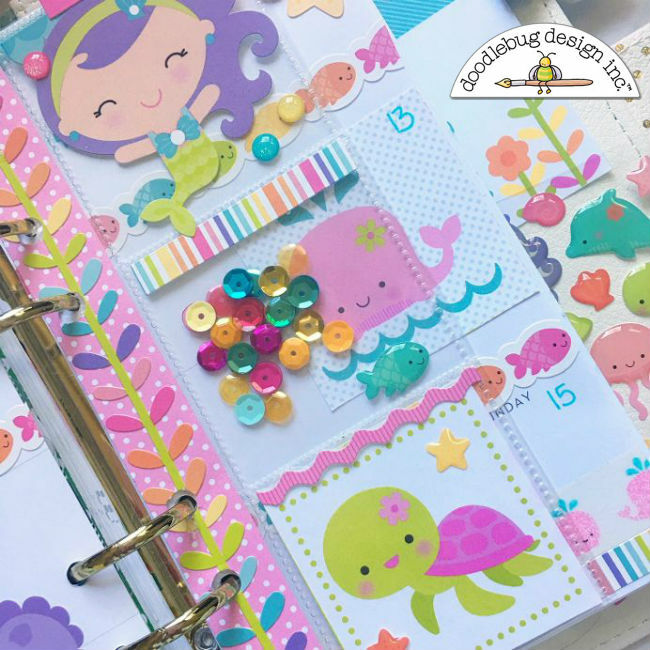 Do you hoard your Doodlebug collections? I certainly do! Now that the summer is here, I just had to break out Under the Sea and create with it. This has always been one of my favorite lines. 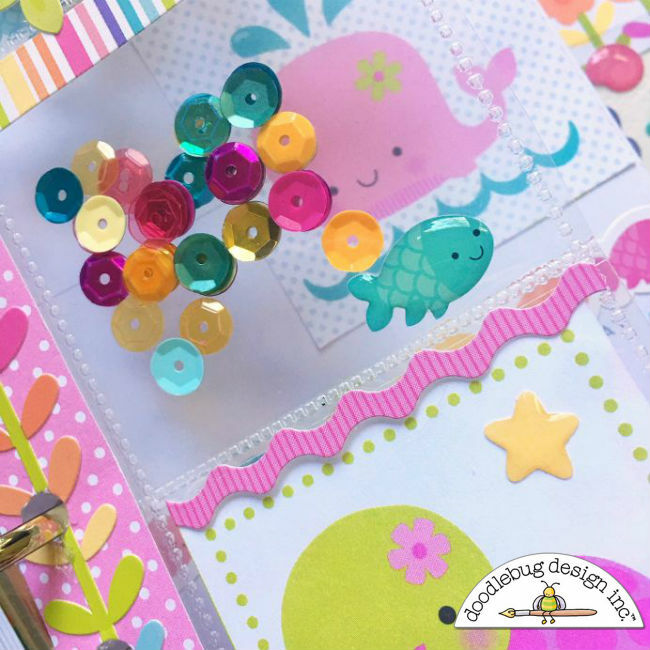 The sweet sea creatures and the pretty colors always make me swoon. And now mermaids are even trendier than ever. So, I just HAD to make something fun for my summer planner. I decided to decorate a weekly spread and add a page marker to it. I love the way it turned out. Here is a look at the whole thing. To make the page marker, I used 6 by 8 page protector that I had. I had 12- 2 inch by 2 inch pockets. I cut three pockets with the part that had the hole punch and went to town decorating it. I added the paper strip with the border sticker in order to cover the holes, since they no longer lined up. Then, I repunched the holes. Next I added stickers, sprinkles and a little paper square. It was easy to find cute items to add. I love being able to see through things, so I only added the paper to one of the pockets. I pulled out some matching sequins. I sprinkled them into the middle pocket and stitched the top closed. I added a sticker to cover the stitching. I love sequins and creating this little shaker box on the page marker was super easy. Finishing off my spread was a lot of fun. I pulled some of my favorite elements from the collection and added the page marker on top. Hoarding our Doodlebug goodies definitely has it's benefits. I can't wait to look through my stash and find something fun to create with next. I hoard my Doodlebug goodies so much!!! 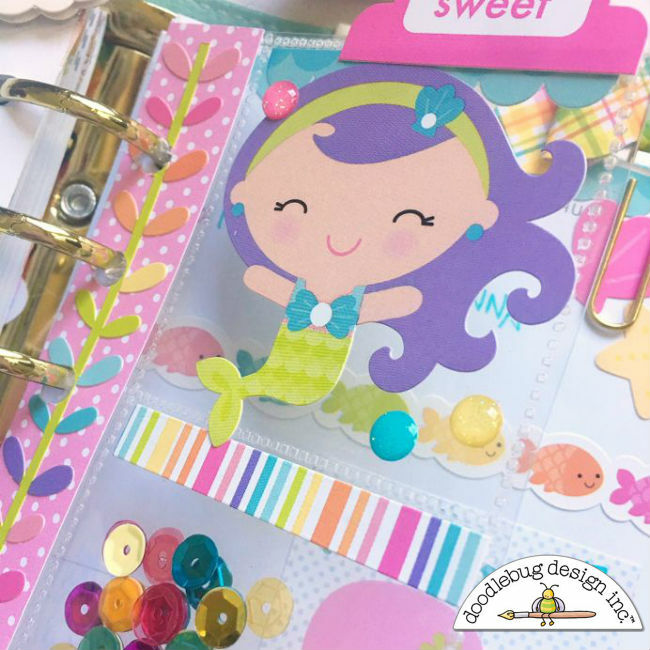 But when I use them in my planner, I am all smiles every time I see them! This is adorable!!! Oh how i love these planner layouts. So wonderful! Thank for the sweet words! Hi. I am from Brazil. This is beautiful. 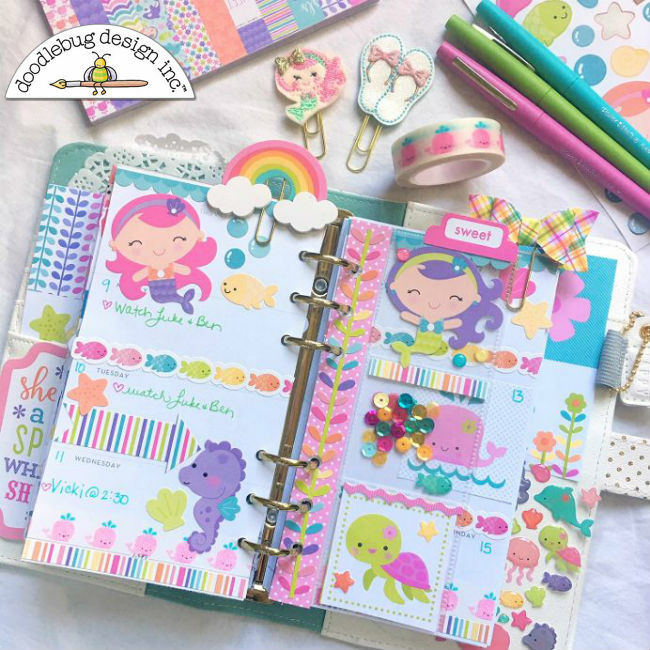 This is such a fun planner spread!! I love the little sequins pockets!! !